On Sunday July 23rd the Dallas Rattlers (10-3) played host to the NY Lizards (7-7) in the Ford Center, at The Star in Frisco, TX. Dallas had not lost a game yet in their home venue (5-0) and was looking to make it their eighth consecutive win and sixth home victory of the season. In front of 4,712 fans the teams would engage in a battle of epic proportion. 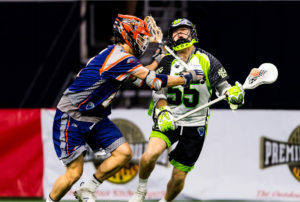 Dallas having already clinched first place and home-field advantage for this seasons MLL playoffs were “resting” two of their best attackmen, Jordan Wolf and Ben Reeves, whereas the Lizards were in need of a win to stay in playoff contention and could not afford such a luxury. New York would prove to be the better team in this contest and managed to outscore and outlast the Rattlers, handing them their third loss of the season and their first loss at home. With this victory, the Lizards kept their playoff hopes alive. Final Score: Lizards 13—Rattlers 12. The scoring for both teams opened up with each team going on a four goal run. The Rattlers struck first with Drew Simoneau (1G, 15-28 FO) winning the opening face off to himself and scoring on the games first shot just seven seconds in. This could be close to an MLL record for quickest goal on a face-off. By the end of the first it was a 6-5 score with the Rattlers ahead. In the second frame, the scoring pace slowed dramatically, with the Rattlers outscoring New York 2-1 for an 8-6 lead at halftime. In the third the Rattlers would score three more, with the Lizards outscoring them with four making it an 11-10 ballgame and Dallas clinging to a one goal lead into the final frame of the game. New York would outscore Dallas 3-1 in the fourth with the Rattlers only goal coming at the 4:09 mark from Ty Thompson (4G), scoring off an assist from Ned Crotty (1G, 1A). This was Thompson’s (34G, 3A) goal number 34 of the season, placing him in 5th place for most goals in the league. Crotty would also hit the 100 mark for MLL career games. Dallas played well, but the Lizards needed the victory and they played with a sense of urgency. Lizard’s Goalie Drew Adams (13 SV, 7 GB); and their defense of Kyle Hartzell (2G); Troy Reh (1G), Matt Landis (5GB); Austin Pifani (4GB, 2 CTO); Joe Fletcher (2GB); and Thomas Zenker all played well as a unit. When you add in their SSDM’s, of Kevin Unterstein (1G); and Jake Bernhardt (1G, 1A) New York was able to contain the lethal Rattlers offense who were without their leading scorer’s, Jordan Wolf (29G, 20A); and top draft pick Ben Reeves (6G, 7A). Thomas Kelly (1A, 13-28FO), the Lizards “FOGO”, neutralized Simoneau at the faceoff X which was a key to their victory. Next game for both teams will be on their respective home fields Saturday August 4th. Dallas will be host the Florida Launch (5-8), who have already been mathematically eliminated from the playoffs. New York will host the other top-seeded team the Chesapeake Bayhawks (9-4). Should they win they would play either Dallas or Chesapeake in the semi-final games August 11th. If the Lizards lose, it becomes a tie-breaker between them and the loser of next week’s Denver/Atlanta where each team sits with a record of 7-6; and the Hounds sitting at 7-7 to see who locks in the fourth seed in this year’s playoffs. The winner of the Denver/Atlanta game will be the third seeded team. If New York wins tomorrow, they along with the winner of the Denver v. Atlanta game will then play on August 11th against either the Rattlers or the Bayhawks. The winners move on to the MLL Championship Game in South Carolina on August 18th. This weekend should be interesting and is the final weekend of the MLL regular season and with three teams holding a record of 7-6, all the marbles are on the line.